This is the paperback edition of a book that has already had a lot of praise, particularly for its encouragement to dyslexic readers, its inspiration to creativity and as an endorsement of the powers of the mind over technology. 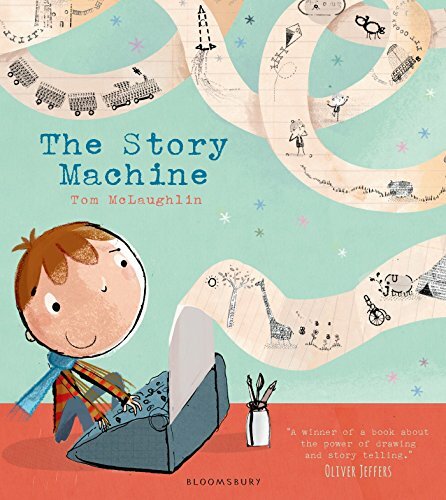 I get all that and I like Tom McLaughlin’s illustrations, particularly the ingenuity with which he makes pictures from typed letters. But this prosaic grouse in the corner is still not convinced by the argument as it is set out – and this is a book that for me raises more questions than it answers. Is dyslexia a matter not of print but of the perception of words – in which case technology is a side issue? Would a child reader be rather confused by Elliott, who is so good at working old technology but doesn’t realise he can draw pictures himself rather more easily without it? Doesn’t Elliott know that when he operates the typewriter, he is making the pictures not the machine, which is totally inert otherwise? Can’t modern technology actively encourage and aid creativity and circumvent the problems associated with print as the sole source of story? This is a book that presses all the right keys in terms of what we enlightened advocates of individual creativity and universal access to story believe, but rather muddles the questions of pencil, brush and paper versus keyboard and screen, the problems created by print for dyslexic readers, and the limiting perception that writing a story means using words rather than pictures. Incidentally, this is a story that, like most picture books and comics, uses both.